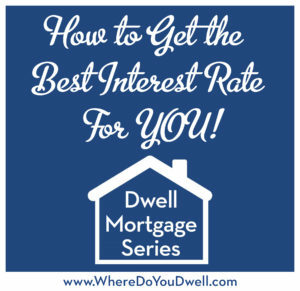 It’s the last week of this series, and we will wrap it up with how to get the best mortgage rate for YOU! We’ll review important points on getting a mortgage that were covered in previous weeks. You’ll also learn the steps to take so you can “seal the deal” and lock in an affordable rate. Getting the best interest rate can be puzzling for many first-time buyers. It’s not as straightforward as getting that low rate you see advertised online. You’ll get the lowest rate only if you figure out how to fit all these pieces together – fees, points, down payment, credit score, your specific home, your goals, and more. And it’s not as simple as lower interest rate equals lower monthly payments either – you may be surprised what could also tag along with your mortgage payment each month! First and foremost, go back to the beginning of our mortgage series and make sure you’ve done what we’ve recommended. Can’t remember? Here’s a refresher. STEP ONE: Figure out how much you want to pay per month before you talk to the lender and ask to get approved for that monthly payment, not how much you could possibly qualify for qualified for! STEP FOUR: Understand how your credit score affects your mortgage interest rate — the higher your score, the lower your rate — and how to build up your credit score if needed. Please stop right now and go over these four steps again so you know exactly where you stand on down payment, what you truly can afford, and your credit score. Now that you’re ready to move forward and “match” your situation with the right loan. But, you must make sure you are looking at the entire loan picture — the mortgage program, the time period you are going to own the home, and the terms of the loan — and not just on getting the lowest interest rate. Sometimes the lowest rate isn’t the “best” mortgage for you. Why? There are many factors or “puzzle pieces” that go into getting the best interest rate for your mortgage. How you end up putting those pieces together will play an important part in creating the best financial position for you. Remember that what’s right for one person could be the wrong decision for another, so really consider YOUR personal situation and make decisions about your mortgage accordingly. And we can’t emphasize enough that you need to review your own goals as a homeowner and what YOU want down the road. One reason to shop around and talk to different lenders is to get a sense of what loan products will work best with your budget and your goals as a homeowner. You need to ask yourself questions about your finances and future, since buying a home is a commitment. That’s why the “go-to” 30-year fixed loan may not be the right choice for you but was for your friend or a family member. If you don’t plan on owning this home for more than 5 or 6 years, you might want to consider an adjustable-rate mortgage (ARM). These loans typically offer a substantially lower interest rate, saving you thousands of dollars while you live there. As a buyer you’ll come across a mortgage chart with examples of interest rates next to “points” or “discount points.” This is usually for 30-year fixed rate loans. As a first-time buyer you may be confused. You’re told if you pay one point, you’re interest rate will be lower than if you pay zero points, and if you pay two points even lower. You may ask yourself what exactly are these points and should I pay them to get a lower rate? A point is equal to 1% of your mortgage amount (or $1,000 for every $100,000). So points are basically an “upfront payment of interest” at closing. Rather than pay it over the life of your loan, you can pay a large chunk when you get the loan. As a buyer, you will need to weigh the pros and cons in getting the lower rate and paying for points upfront. Does it work with your long-term goals as a homeowner? Since interest rates are pretty low right now and if you’re not planning to stay in your home for more than 5 years or more, then paying points doesn’t make sense. Why? You’ll never recoup the costs of your upfront payment over the life of the loan even if lower monthly payments may seem tempting. On the other hand, if you plan to live in your home for many years or interest rates go up, then the benefit of the lower rate will kick in and save you money in the long run. However, you’ll need to determine if you can afford to pay an extra couple thousand or more at the time of your closing for those points. Review fees for FHA loans. Don’t always assume a FHA loan will be cheaper or better. Not only do you pay an upfront premium for mortgage insurance, but you’ll also pay a recurring annual cost of up to 1.35% of the outstanding loan amount (added to the monthly payment) for the life of the loan. Take advantage of the mortgage disclosure forms. There is no excuse for today’s buyers not to know about “hidden fees.” These forms simplify and disclose a loan’s terms and cost to borrowers — the Loan Estimate, given three business days after application, and the Closing Disclosure, given three business days before closing. And speaking of lock-ins, let’s go over the who, what, where, how, and when of “locking-in” an interest rate. Let’s say you’re happy with your rate and are prepared to lock it in. Do you know exactly what to do? You can only lock in once you are under contract for a home, not before. Once you go under contract, contact all the lenders you may want to work with to compare rates. You MUST contact them on the same day, generally at the same time of day because interest rates change all day, every day. Once you compare rates and decide on a lender, tell them to lock you in. You need to do so quickly or rates could change, and the lender can’t guarantee your initial rate if they do change. This can happen in a matter of hours…so be prompt! What exactly is a lock-in? A lock-in is a lender’s promise to hold a certain interest rate and a certain number of points for you, usually for a specified period of time (typically 30 or 60 days), while your loan application is processed. It’ll protect you against any rate increases during the loan process. However, the downside of a lock-in is that rates may drop and you may not be able to take advantage of any decreases. What to look for from a lender? Remember to shop around for a lender during the pre-approval process first. Meet or talk with at least three lenders and see what they will offer in terms of interest rate, points, and fees, including any lock-in fees (which may or may not be refundable). When you’re selecting a lender also consider how comfortable and confident you are in that lender and if they have a good history of service and closing loans on time. You want someone who will get the job done, who is honest and reliable – and offer you a loan with a good rate and terms! How long is the lock-in period? The lock-in period should be long enough to allow for settlement and any other contingencies imposed by the lender. Have the lender estimate the time needed to process your loan. Make sure you factor in any possible delays (construction issues, appraisal, inspections, etc.). Lock-ins of 30 to 60 days are common but some may range from seven to 120 days. However, the shorter your lock-in period, the lower your interest rate or fees/points (Another bonus tip for you!). A longer lock-in period could mean an increase in the interest rate or added points. It could be a very slight increase or a half a percentage point. It’s important to know your lender’s terms and procedures since each lender can differ. How can you protect yourself? Have a tangible record of your arrangements with the lender in the event of a dispute. Make sure you have a written rather than verbal lock-in agreement. You MUST fully understand your lender’s lock-in rules and procedures. What happens if your lock expires? If your closing is delayed and your lock timeframe has expired (see above), you most likely will lose the interest rate you had locked in. Lenders will offer you a loan based on the prevailing interest rate and points, which may now be higher due to market conditions. Sometimes, though, the rates are lower. If the delay is the lender’s fault such as heavy demand, the lock period may be extended; and sometimes it may be extended even if it is your fault. Again, check the specific lock-in rules with your lender. What if interest rates dip while you are locked in? Ask your lender if they have a “float down,” whereby if your rate lowers more than a certain amount within a short time before settlement, you get the lower rate for no charge. However, YOU have to be the one to ask if your lending institution offers this option AND be the one to keep track. Make sure you ask your lender upfront what the criteria is to get the lower rate if rates fall before your settlement. That way you’ll know what to keep an eye on and when to reach out to them to lower your already locked-in rate. If you have been using all of our tips we have shared during our How to Get the Best Mortgage Series, you’re going to get a better mortgage and interest rate than most buyers. Once you get the quotes from the lenders (remember at least 3) and you know which bank and lender is giving you the best interest rate, go to one of the other lenders and ask them to “beat it” so they can win your business. Sometimes lenders will give discounts or special pricing so they won’t lose potential customers. We covered a lot of information in this last article – the four steps you need to understand and figure out first, putting the “puzzle pieces” together to get the right loan and rate for you, and, finally, locking in that good rate. We hope you enjoyed our 9-part How to Get the Best Mortgage Series. We are here to answer any of your questions.